Beach Within Reach wheelchairs are available for use from 10.00 to 16.00 every day including Bank Holidays from mid-May until the beginning of September. They are sited on the following beaches. Minnis Bay, West Bay, St Mildred’s Bay, Westbrook Bay, Margate Main Sands and Viking Bay in Broadstairs. 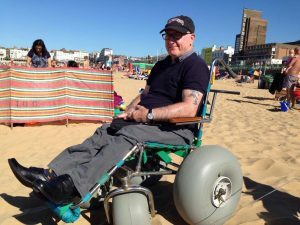 Ramsgate Main Sands wheelchair is currently available at weekends only and this can be subject to change. The wheelchairs can be booked in advance using the booking form on the location pages but without a confirmation from the charity the booking can not be guaranteed. Wheelchairs can be made available at some of the smaller bays on request only. They can also be used throughout the year by prior arrangement. Please call us on 07432 648275 for further details. Wheelchairs can be loaned from the Your Leisure Bay Inspector on the beach on a first come, first served basis, although booking is available. This is slightly different at Ramsgate Main Sands, please see the Location page for details. When loaning a wheelchair we ask that you complete a loan agreement form and provide proof of identification (including address). We also supply you with information about using the wheelchair which must be read before signing the agreement form. 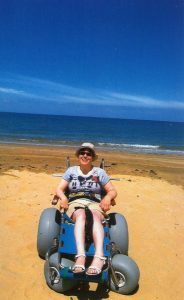 The wheelchair cannot be used independently and the user will need the assistance of a carer at all times to help them into the wheelchair and on to the beach. Unfortunately due to health and safety requirements Bay Inspectors are not permitted to push the user in the wheelchair or assist you with transfers in any way. There are a variety of accessories available for the wheelchair including neck and lateral supports. These must be requested in advance, with a minimum of 24 hours notice. You can complete a booking form requesting this or call us to make enquiries. From Summer 2017 there will be a hoist available at Minnis Bay, this will only be available on prior request. A minimum of 24 hours notice is required. You must be fully trained to use a mobile hoist and provide your own sling. There is a separate form to sign when using the hoist. We will never charge for the use of our wheelchairs but we do ask for a donation to the charity so that we can continue to offer this service to the public. The Bay Inspectors are unable to take donations but there are charity collection pots on the majority of the beaches, the Bay Inspector will be happy to tell you where the nearest one is. Alternatively you can make a donation via Paypal on this website. There are also details of how you can donate via your mobile phone. Just click on the donate page for more information. RESPONSIBILITIES OF THE WHEELCHAIR HIRER: The wheelchair user and their carer must ensure that the wheelchairs maximum load weight of 18 stone (114kg) is not exceeded. Any wheelchair defects must be reported to Beach Within Reach and the Your Leisure Bay Inspector immediately. The wheelchair is to be used in the correct manner, not causing any danger to either the wheelchair occupant or others. Please return the wheelchair when the hire time is finished. WHEELCHAIR RETURNS: The wheelchair must be returned to the Bay Inspector when you have finished using it. It must not be left unattended or taken from the beach where it was loaned. WHEELCHAIR DEFECTS: If, at any stage during the loan period the wheelchair becomes defective it is the responsibility of the user to contact Beach Within Reach and the Your Leisure Bay Inspector to report the defect. If the wheelchair has a defect, it must not be used until it has been repaired or replaced by Beach Within Reach. Beach Within Reach and Your Leisure do not accept responsibility for the use of a defective wheelchair which causes damage or injury to anyone or anything. DISCLAIMER: Beach Within Reach and Your Leisure do not accept any responsibility for misuse or for use of a wheelchair that is not safe. All wheelchairs that are loaned from Beach Within Reach are delivered in full working condition and are the responsibility of the user/carer while in their sole possession. Beach Within Reach and Your Leisure request that the seat belt be used at all times of occupancy for safety reasons. Safety of the user remains the responsibility of the carer and both Beach Within Reach and Your Leisure are relieved of all liabilities.